Content Services Provider, India | Ascezen Consulting Pvt. Ltd.
Ascezen Consulting Private Limited is an IT services company based in Lucknow, India. The company is a reputed content services provider and provides quality content services to businesses around the world, particularly in the information technology industry. With a goal to become one of the leading web and content services providers in India, we strive to deliver appealing websites, original and engaging content, meet deadlines, and ensure that we meet our customers’ business requirements. As an end-to-end web and content services provider, we specialize in providing complete range of services in Website Development, Digital Marketing, Technical Writing Services, Web Content, Business Content Writing Services, Marketing Content, SEO Copywriting, Social Media Support, E-Learning services, and Technical Communication Training provider to help our clients realize their goals. Our services are marked by original ideas, high-quality work, and a competent team of web developers, graphic designers, technical writers, content writers. You just have to fill up the “Request a Quote” Form or send an email to biz(at)ascezen.com to let us know about your content needs and we shall get back to you with what we can offer. If you wish to take a look at our work samples, we would be happy to arrange a video call to show our work and talk about our competencies, skills, and experience. However, the content on Ascezen website and the company blog are entirely done in-house and can be treated as work samples. Why Ascezen® as Content Services Provider? 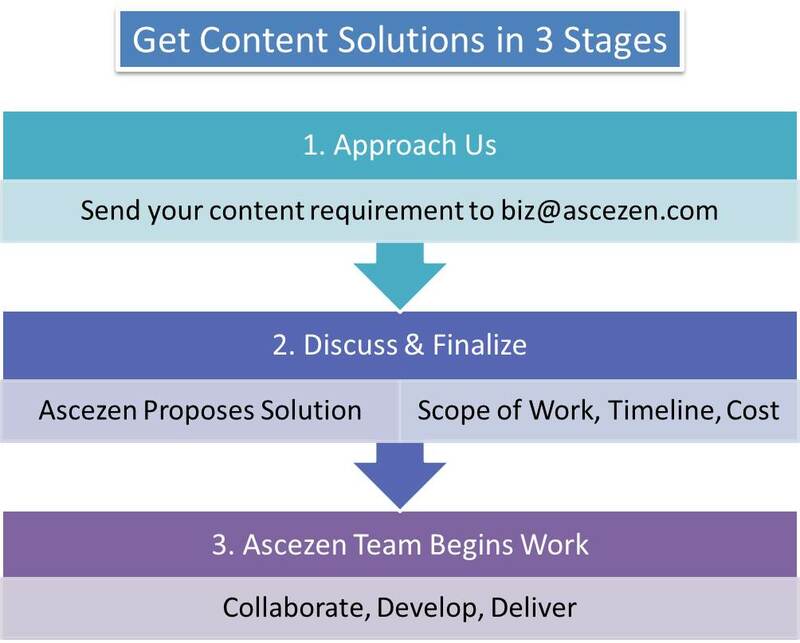 Ascezen Consulting is one-stop content services provider that can serve content for your organization’s technical, learning, and business needs. Apart from cost advantage, we do not compromise on quality. Our quality policy explains the key parameters that define quality of content. Accuracy: Content is accurate and precise with no ambiguity. Ideas incorporated in the content are specific and clear-cut. Originality: We ensure that content we deliver is original. It passes through plagiarism checks before it reaches you to authenticate its originality. Conciseness: The content we deliver is comprehensive yet brief. It is concise and clear while covering the necessary information. Appealing: We make sure to deliver appealing piece of writing that makes reading an informative and pleasant experience. Engaging: Our content is attention-grabbing and keeps the reader hooked till the last. We give content that succeeds in stirring and sustaining interest of the reader. Convincing: The content we provide is well-written and involves detailing to make sure it convinces the reader and satisfies our customers.